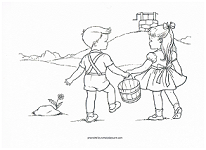 The Jack and Jill lyrics date back to the 18th century. 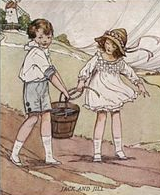 There are a few suggested theories concerning the history of the rhyme, none of which should be explained to children. Some of the theories are pretty dark and would totally take away from the fun of learning a new rhyme. It is also thought to be a simple nonsense rhyme. 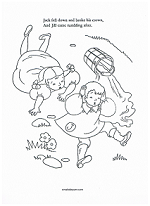 This is based upon the thought that water runs downhill, therefore no-one would go up a hill to fetch it. Vinegar and brown paper, however, is an old time cure to help draw bruises out of the body. Either way, in today's world it is simply a fun rhyme to say. Kids catch on to the verse quickly. I told my daycare kids it simply meant that climbing or carrying heavy items can be dangerous and that people have to be very careful when doing such a thing. Typically only the first verse or two is taught to children, but I have included the entire rhyme for those who have interest. 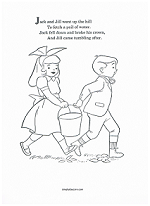 Scroll down past the lyrics to find coloring pages to go with the rhyme. Just for reference, the following verses were added in the 19th and 20th centuries. Either-or comprised the third verse and fully explains why children are only taught the first two. to see Jack's paper plaster.